Gameresort’s NinjAwesome is a side-scrolling endless runner that lets you control a speedy shuriken throwing Ninja. You will need to press the left and right part of the screen to make him jump and throw shurikens. The game has different types of missions, such as Espionage, Sabotage etc. 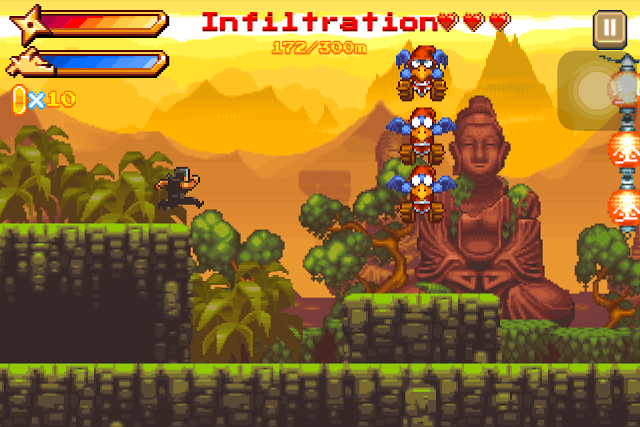 It’s a pure platformer with retro-style visuals so don’t expect any sneak-and-kill mechanics. There’s no hurry to grab every scroll or destroy every bridge you see. Because such missions enter endless mode until you complete the objectives, you will keep finding scrolls and collapsible bridges on your way. Try to reach those that aren’t too hard or surrounded by spiky traps or cannons. On your way don’t forget to destroy floating lanterns to get coins. Such missions can provide a great opportunity to earn lots of coins. Make sure your ninja has increased health when attempting Espionage and Sabotage missions. More hearts will let your ninja sustain more injuries and he won’t die early. So if your ninja’s health has three hearts, he will die after getting injured the third time. Try to upgrade the health ability before doing anything else. 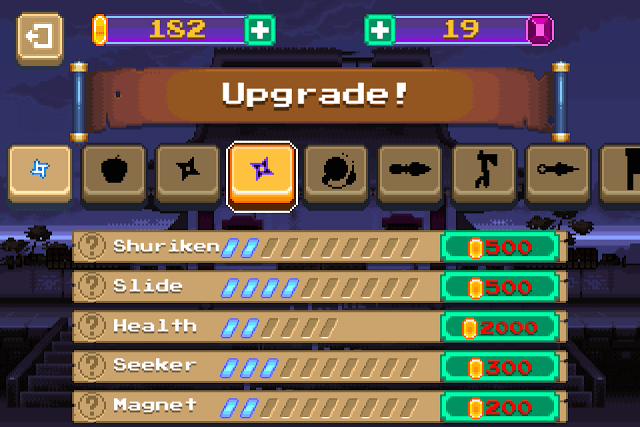 Shuriken: Upgrading this ability lets you throw more shurikens before the weapon meter at the top-left corner of the screen decreases. Slide: With this ability upgraded, your ninja can perform a slide attack for a longer period of time. Health: Probably the most important ability. 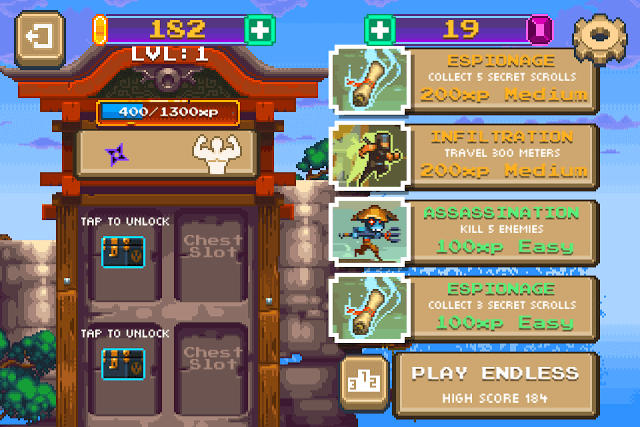 With every upgrade, the heart count increases, making your ninja sustain more injuries without dying early. It becomes the costliest ability after upgrading it the second time. Seeker: This ability is triggered when your ninja collects a Seeker power-up that gets dropped from enemies or destroyed objects. The Seeker power-up automatically finds and attacks incoming enemies. With this ability upgraded, the power-up will last a bit longer. Magnet: This ability is triggered when your ninja collects the magnet power-up dropped by eliminated enemies or destroyed objects. With this ability upgraded, the magnet power-up will attract scattered coins for a longer period of time. Complete “Easy” missions first. Such missions have fewer traps and enemies and the objectives can be completed pretty fast. Plus you will get 100 XP and a common chest. Go for Infiltration missions because they are the easiest to complete as you won’t have to find any scrolls or destroy bridges. You just have to travel a certain distance to complete it. When attempting Easy missions try to destroy as many floating lanterns as possible. They contain coins. Killing enemies will also drop coins. The next easiest mission has to be “Assassination”. Such a mission will ask you to kill a certain number of enemies. Look for easy assassination missions as they will contain less traps and obstacles. The endless mode unlocks when you reach level 1. It does not contain any objectives, so it’s the perfect place to earn coins. However, endless mode is a hard nut to crack as there will be plenty of obstacles, enemies and spiky traps. Also platforming will be very tough as platforms will float mid-air, far away from each other. You will have to double tap quickly for performing higher jumps. Chests that you receive after completing an objective of a mission can contain anything ranging from coins to a new weapon. The harder the mission, the better rewards a chest will drop. Your ninja can jump on top of enemies without getting injured, and sometimes can jump over their heads to go from one spot to another.